A cataract is a clouding of the eye’s naturally clear lens. Vision through eyes with cataracts may be characterized as looking through a foggy window, experiencing halos or glare at night, or having difficulty seeing smaller print especially when the lighting is dim. 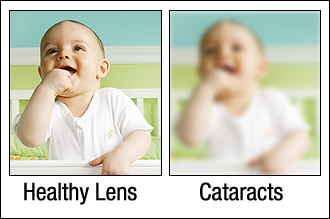 Cataract development is usually a very gradual process of normal aging, but can occasionally occur rapidly. Many people are unaware that they have cataracts because the changes in their vision are so gradual. Cataracts are very common, affecting roughly 60% of people over the age of 60, and over 1.5 million cataract surgeries are performed in the United States each year. Cataract surgery is a very successful operation. One and a half million people have this procedure every year and 95% have a successful result. As with any surgical procedure, complications may rarely occur. In most cases however, vision as well as quality of life improve significantly. Many advances have been made in the field of cataract surgery. Laser cataract surgery is now available and has helped to improve safety, which therefore reduces risks and complications. Patients also have the option to gain tremendous independence from glasses with advanced technology implants (the lens that will replace the cloudy cataract lens).